Stenson Hill Farm, Stenson Hill Farm in Stenson, near Derby sleeps 20 people. These large attractive properties, situated in the grounds of the owner’s home, are just off a track in peaceful countryside, yet close to many amenities. Stenson Hill Farm can accommodate the largest family party, with own snooker room and attractive conservatory providing the dining area for the whole party and a lawned garden and large patio, whilst Stenson Lodge accommodates the slightly smaller group and has an attractive lawned garden overlooking the owner’s aviary with exotic birds. 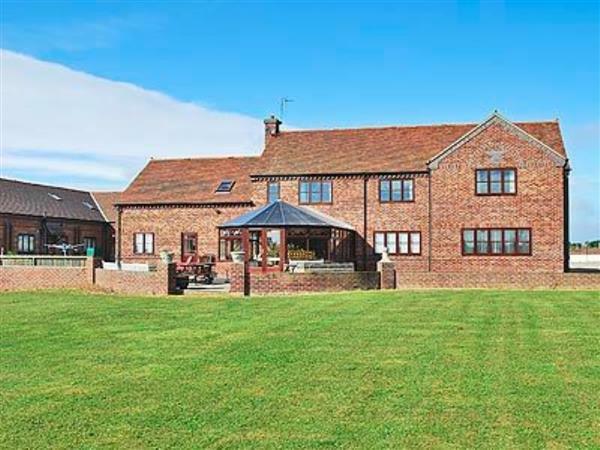 Both enjoy views over surrounding farmland and boast built-in barbecues. There are many attractions around with Calke Abbey and Derby with its theatres, clubs and restaurants within a 15 minute drive, whilst Ashbourne and Dovedale are 15 miles. Well worth a day out for any family or group are Matlock Bath, 20 miles, Alton Towers, 22 miles and Chatsworth House and Haddon Hall, a comfortable drive away. Both holiday cottages (refs 16165 and 23666 [Stenson Cottage]) can be booked separately or together. Shop and pub within 1/2 mile. Ground floor: Living room. Dining room/conservatory with French doors. Dining room/kitchen. Kitchen. 1 twin bedroom with en-suite shower room and toilet. Separate toilet. Games room. First floor: 8 bedrooms: 5 twin, 2 double, both with additional singles and en-suite shower room with toilet, 1 double (5ft) with en-suite shower room and toilet. Bathroom with bath, shower cubicle and toilet. Bathroom with toilet. Gas central heating, gas and electric chargeable. Bed linen included. Towel hire. Cot. High-chair. Three portable TVs. DVD. Stereo/CD. Electric cooker. Gas cooker. Microwave. Washing machine. Tumble dryer. Dish washer. Freezer. Two f/freezers. Payphone. Garden and furniture. Ample parking. Games room with snooker table and coin-operated pool table. Stabling by arrangement with owner at cost. Pets welcome, to be kept on lead at all times. No smoking please. Easy walking access. Holidays at Stenson Hill Farm, Stenson Hill Farm run from Saturday to Saturday. For a better idea of where Stenson Hill Farm is, you can see Stenson Hill Farm on the map below. Stenson Hill Farm is in Derbyshire; should you be on the lookout for a special offer, you can find all the special offers in Derbyshire. It's always worth checking to see what is on offer at the moment. Do you want to holiday near Stenson Hill Farm (16165), you can see other cottages within 25 miles of Stenson Hill Farm; have a look to find your perfect holiday location.